Emblem of the Local Defence Forces. On top: "Homeland, Honour, Sincerity." Below: "Syrian Arabic Republic. The army and armed forces- Local Defence Forces." Besides the well-known National Defence Forces (NDF) that were set up in 2012 with oversight from Iran to act as a counter-insurgency force and auxiliary militia network for the Syrian army, there exists a similarly named but distinct set of militias specific to the Aleppo area known as the Local Defence Forces (Quwat al-Difa' al-Mahalli- LDF). In brief, the LDF consists of a variety of local militias such as Katibat al-Nayrab al-Maham al-Khasa (The Nayrab Battalion- Special Operations), Liwa al-Baqir (The Baqir Brigade), Fawj al-Safira (The Safira Regiment) and Fawj Nubl wa al-Zahara' (The Nubl and Zahara' Regiment). These names mostly refer to areas and towns in the vicinity of Aleppo city, but Liwa al-Baqir is named after the fifth Shi'i imam Muhammad al-Baqir. A representative for Katibat al-Nayrab affirmed to me that the LDF totals 50,000 fighters (an obvious exaggeration), set up in 2012 by Iran as an auxiliary force for the Syrian army in the Aleppo area. 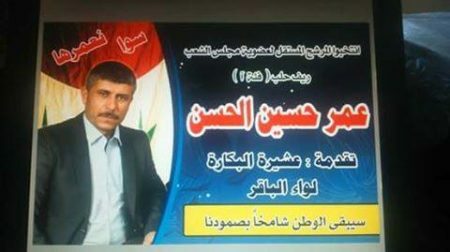 Unsurprisingly, the LDF is linked with Hezbollah as well, though it is Liwa al-Baqir that advertises this connection more than the other LDF formations: something reinforced by the fact that the Lebanese singer Ali Barakat, most well known for his songs for Hezbollah, put out a song dedicated to Liwa al-Baqir. Liwa al-Baqir also appears to be tied in particular to the al-Bekara clan in Aleppo that has gained notoriety for its support for the regime, especially as it is predominantly Sunni (the evidence may suggest a degree of Shi'ification as well in relation to Liwa al-Baqir). "Liwa al-Imam al-Baqir: al-Bekara clan." 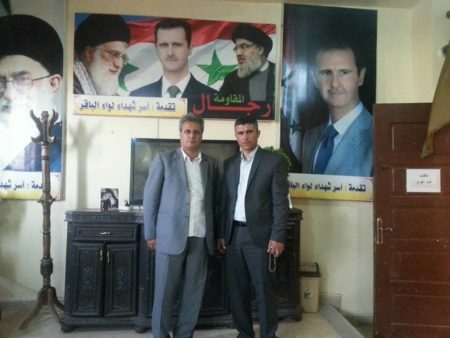 Note the portrait of Hezbollah leader Hassan Nasrallah on the left and Bashar al-Assad on the right. 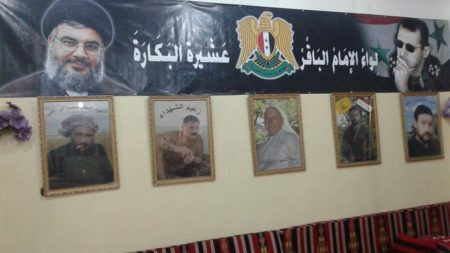 Also note one of the portraits featuring the Hezbollah and Syrian flags. "The mujahideen of Liwa al-Baqir from the base of operations: God protect you, our mujahideen"- note the Hezbollah armpatch. Social media graphic for Liwa al-Baqir, featuring the familiar moniker of "The Islamic Resistance" (al-muqawama al-islamiya). Liwa al-Baqir posters. Note the central one: "Men of the Resistance." Includes Iranian Supreme Leader Ayatollah Khamene'i, Assad and Nasrallah. "We, the men of Liwa al-Baqir, were in the company of the men of Hezbollah when they arrested dozens of the pigs of Nusra whom we wanted to kill but then one of the mujahideen reminded us saying: 'Oh youth, remember the words of Imam Ali- peace be upon him- who says: 'And don't kill those who surrender but rather grant them food and grant them protection." Prior to these engagements, Liwa al-Baqir claimed participation in the operations leading to the breaking of the rebel sieges of the Shi'i villages of Nubl and Zahara' to the north of Aleppo city, as well as operations in south Aleppo countryside as part of the series of Russia-Iran backed offensives that began in October of last year to allow the regime to regain the initiative against the rebels. Unlike a number of pro-Assad militias whose total numbers of 'martyrs' since inception normally do not amount to more than a few or several dozen, Liwa al-Baqir claimed 246 'martyrs' as of 21 March 2016. This claim to a large number of 'martyrs' is corroborated to a certain extent by the displays of posters of these 'martyrs', samples of which appear below. Dedicated to 'martyr' Muhammad Hussein Raslan, Top-right inscription: "Liwa al-Imam al-Baqir: Local Defence Forces." Note the faint Hezbollah imagery in the background. Some more 'martyrs' of Liwa al-Baqir, though here the term used is 'Fawj al-Imam Baqir' (no real difference in meaning). 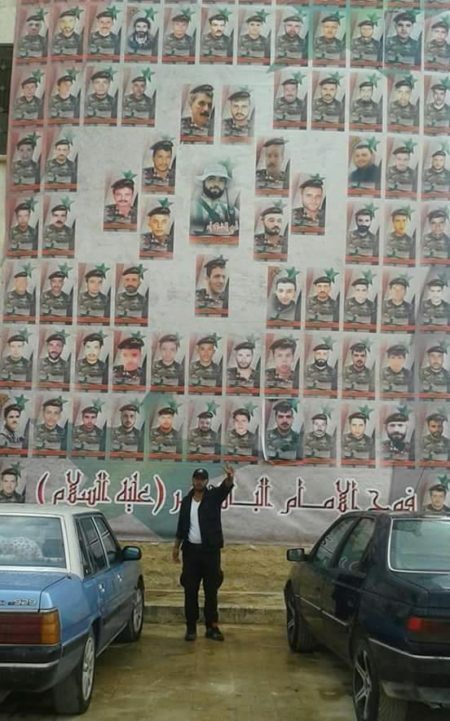 Large Liwa al-Baqir mural, likely dedicated to 'martyrs' in the militia or linked to it. Just as the Syrian Social Nationalist Party has used its militia presence in Syria to push for political influence in the form of candidates for the recent Syrian parliamentary elections, so too did Liwa al-Baqir throw its weight behind an ostensibly independent candidate called Omar Hussein al-Hassan. "Vote for the independent candidate for membership of the People's Council. Aleppo countryside (group A). Omar Hussein al-Hassan. Offering from: al-Bekara clan, Liwa al-Baqir. The homeland will remain on high by our steadfastness." The leader of Liwa al-Baqir Khalid al-Hassan (Baqir)...and the distinguished members- members of the Committee of Reconciliation, National Accord and Social Coordination- are operating in the framework of the project of national reconciliation in Aleppo province. We request aid within the systems and laws and in cooperation with Mr. Governor of Aleppo in making their mission succeed. To connect with us in the Liwa al-Baqir centre in Tarkan [a village in the Safira district]." In this context, it should be noted that Liwa al-Baqir was also involved in a prominent conciliation event at the end of 2015 involving two major families- Abu Ra's and Berri (the latter also notorious for its support for the regime)- including an event involving military and security officials as well as 'ulama' in Aleppo. Interestingly, in March 2016 Liwa al-Baqir claimed the 'martyrdom' of Khalid's brother. No specific details were offered as to the circumstances surrounding his death, though one page for Liwa al-Baqir seemed to present it as a 'martyrdom' jointly claimed with Hezbollah. According to the Katibat al-Nayrab representative, he was actually assassinated in Lebanon. The other LDF formations are less remarkable. For example, Fawj al-Safira, as its name suggests, operates in the Safira area of Aleppo, also renowned as a bastion of regime support. Fawj al-Safira, in repelling IS attacks in the Safira area, has notably coordinated not only with the Syrian army but also the local Safira branch of the Muqawama Suriya, a militia primarily based in Latakia whose founder Ali Kayali has been declared by the Muqawama Suriya to have been 'disappeared' (mughayyab) in a possible cover-up of his death since his suspected killing in late March 2016. LDF forces have had a role in fighting to the south of Aleppo city as IS has repeatedly harassed regime control of the supply line to Aleppo city via Khanaser. 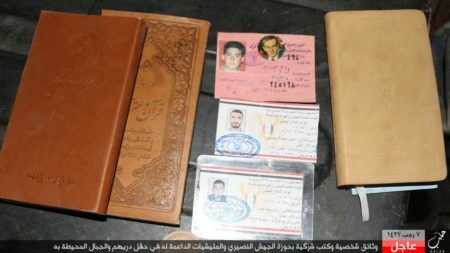 Among items captured by IS in an assault in mid-April were LDF ID cards as shown in this photo. Instead of giving a chronological list of engagements by the LDF, it remains to note that on a wider level the LDF has a 'political direction' division that puts out newsletters, featuring political and military developments as well as excerpts from media outlets and political analysis. For example, issue no. 81 that was recently put out opens with commemorations for the deceased Hezbollah commander Mustafa Badreddine (aka Dhu al-Fiqar), who was central to organizing Hezbollah's efforts in Syria. The political analysis section also gives a summary of Badreddine's life and accomplishments. In comparison with many other pro-Assad militias, the LDF clearly amounts to much more than a seemingly 'exotic' name and brand. On the contrary, the LDF has been important for organizing local pro-Assad support networks in Aleppo that transcend the sectarian divide to a degree. In part these networks explain the regime's staying power in Aleppo, rather than just foreign manpower influx in the form of Iranian personnel and Shi'i militias. At the same time, one should not forget the importance of Iran and Hezbollah in the organization and advising of local militia support networks- an analysis that clearly applies to the LDF. Appendix update (24 May 2016): An account of the origins of Liwa al-Baqir is offered by the pro-opposition site alSouria.net in an article from January 2016. 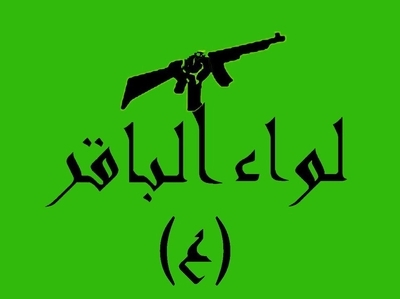 According to this account, Liwa al-Baqir was set up as a distinct brand and formation by the LDF in 2015, initially working under Harakat al-Nujaba', which was responsible for the Shi'ification and arming of its fighters. This same report affirms that Liwa al-Baqir now operates separately from Harakat al-Nujaba'. The LDF more generally, though having roots in and ties to predominantly Sunni 'shabiha' clan networks, is portrayed in this article as having come under the increasing influence of the foreign Shi'i militias that have come to the Aleppo area. There is likely something to this, for as I noted in the main article, the evidence from Liwa al-Baqir seems to suggest at least some Shi'ification among al-Bekara clan members. In any case the LDF was set up in the first place by Iran, so it is hardly surprising if Shi'i militias tied to Iran (which have made a prominent mark in Aleppo since 2013) have sought to influence the LDF even further in orientation. "Aleppo has seen since the beginning of the protests in it formations affiliated with the LDF formation led by the Berri family a great part of which is known for its support for the regime and its participation in repressing demonstrations, but the feared status and importance of this formation has retreated with the beginning of the arrival of foreign militias to the regime's areas in Aleppo, and the Shi'a militias have managed to include the LDF through Shi'ification of its fighters. The alSourianet correspondent in Aleppo, Muhammad al-Shafi'i, points out that the LDF formed Liwa al-Baqir last year, with its base in the village of Tarkan in south Aleppo countryside, clarifying that the brigade worked within the militia formation of the Iraqi Harakat al-Nujaba', which uses the al-Assad academy as a base for its military operations. And special sources mention to alSouria.net that Liwa al-Baqir currently works separately and independently from Harakat al-Nujaba' to regain authority over Aleppo, and has portrayed itself as an auxiliary for the forces of Bashar al-Assad's regime. 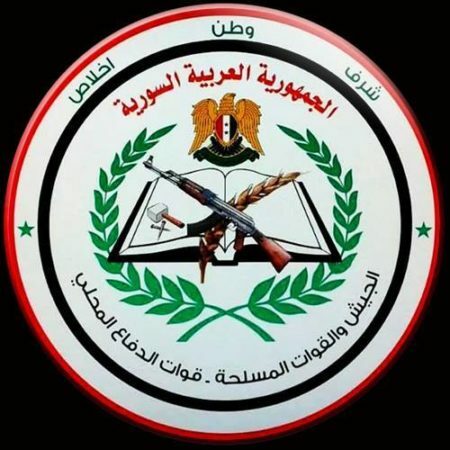 According to the same sources the brigade's numbers are around 2000 fighters, who have obtained their weapons previously from Harakat al-Nujaba', in addition to their receiving salaries of 25,000 Syrian pounds [per month]. The Iraqi militia supervised the formation of this brigade after the Shi'ification of its members and the establishment of special camps for them. They were trained in assault methods and were deployed in the recent south Aleppo battles, and Liwa al-Baqir is led by "Khalid al-Hassan al-Aloush al-Baqir" and with protection from people in the Berri family. 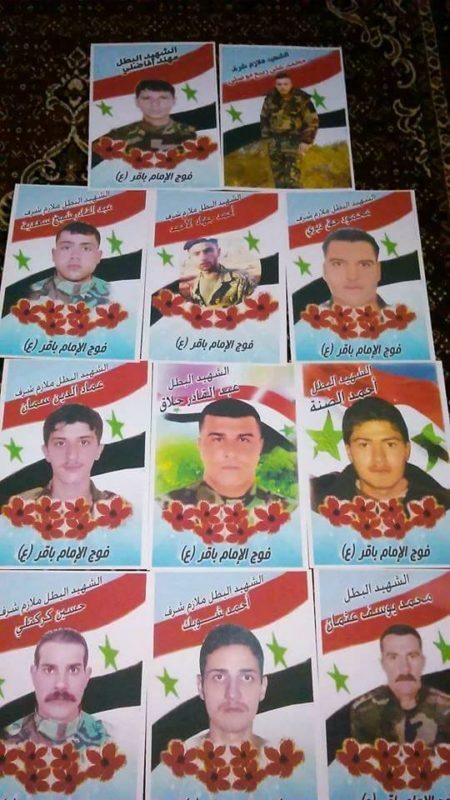 And the sources mention to alSouria.net that the number of those from the brigade killed in the recent battles of south Aleppo countryside reached 50 members, all of whom are from the 'Shabiha,' while the number of those killed from the brigade since its formation until the beginning of this year reaches up to 300 killed. The brigade participates in frontline duty operations in the villages of south Aleppo countryside controlled by the regime and its militias since two months ago, in addition to the presence of military checkpoints of the brigade inside Aleppo. In addition Liwa al-Baqir has special training camps in the villages of Tel Shaghib, Issan, Ain Issan and Tarkan in south Aleppo countryside." "Liwa al-Baqir affiliated with Hezbollah: the announcement of the formation of Liwa al-Baqir was done from the beginning of the crisis in Aleppo and its siege at the hands of the terrorists. Liwa al-Baqir is among the strongest of the military formations in Syria and it is the strongest military formation in Aleppo, as they have participated in the battle to break the siege of Aleppo central prison, the battles of Aleppo city, the battles of Jama'ia al-Zahara', the breaking of the siege of Nubl and Zahara', as well as their advancing in the south Aleppo countryside from al-Wadihi to Tel al-Eis and finally to Khan Touman. The first foot that was placed in Khan Touman was the feet of the mujahideen of Liwa al-Baqir who are spread on all the fronts of Aleppo from the Ramousa front to Salah al-Din, Ashrafiya, Jama'ia al-Zahara', the north, west and south Aleppo countryside, Aleppo's only supply route [artery] Khanaser and [the path] towards Raqqa. They have recorded deeds of heroism and have brought forth blood and martyrs: more than 251 martyrs. In every attack the terrorists undertake, they [Liwa al-Baqir] send reinforcements for the Syrian Arab Army." The names: Hamza Baqir and Khalid Baqir. The nickname of al-Hajj Hamza is al-Hajj Abu al-Abbas, as for al-Hajj Khalid (al-Hajj Baqir). Al-Hajj Hamza Baqir is the younger brother of the leader of Liwa al-Baqir al-Hajj Khalid Baqir. 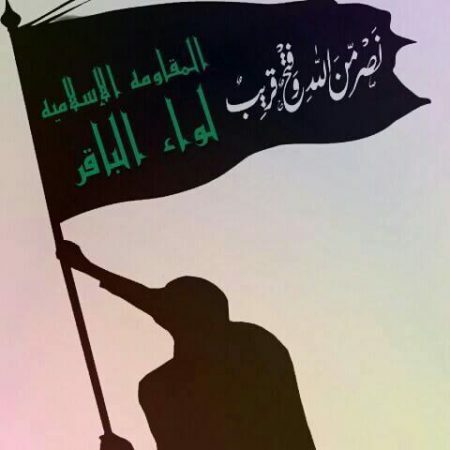 al-Hajj Hamza established a brigade from its beginnings with his elder brother al-Hajj Khalid as the brigade began from 13 fighters before becoming today 3000 mujahid fighters and endured what a brigade endured in its beginnings until it was able to attract hundreds of the strong teenage youth. Al-Hajj Hamza worked as a fine gifts sculptor before the war in Syria but after the force of treachery assassinated his father and elder brother Ali, he and his brother al-Hajj Khalid decided to form Liwa al-Imam al-Baqir. And the training of many members on the path of jihad and defending the homeland began. al-Hajj Hamza and al-Hajj Khalid had the honour of participating in the July 2006 war that the heroes of Hezbollah waged against the occupying Zionist enemy as they undertook operations with Hezbollah in the midst of the gatherings of the Israel enemy and inflicted what they inflicted on it from losses. The most important thing that distinguishes al-Hajj Hamza is strong silence and calm, together with the fact that he limits a response to any question with a word, and he is the leader of the special snipers division and he established the rapid reaction division, while al-Hajj Khalid Baqir participated greatly in the formation of the Local Defence Forces, which were formed in Aleppo two years ago. al-Hajj had the great role in many of the battles defending Aleppo, including the al-Ramousa battle, the battle to liberate Abu Jarin and Safira, and in the south, north and west Aleppo countrysides as well as inside the city. Al-Hajj Hamza enjoys high quality leadership skills that allow him to draw up strategic plans for the brigade and its divisions around the city of Aleppo. As for al-Hajj Khalid his elder brother nicknamed Baqir, inside the brigade he is called protector of Aleppo, because he is always the person who knows how to close the entrances to Aleppo in the face of the armed men, and on every occasion he has caused them great losses on all the fronts of Aleppo, the most important being: the south and west Aleppo countryside, and before them the north and east countryside. In short, the lions of Aleppo in the meaning of the word." Can this account be reconciled with the ones presented in the main article and the initial appendix update? Did Liwa al-Baqir come first, or the Local Defence Forces? To begin with, it should be noted that the claim to have operated since the beginning of events in Aleppo (or more generally, from the beginning of the 'crisis' and 'revolution') can function as a rhetorical flourish to overstate one's role in the fighting: or one might exaggerate the length of existence of the more formal structure under which one operates to present a more cohesive fighting force from the outset. 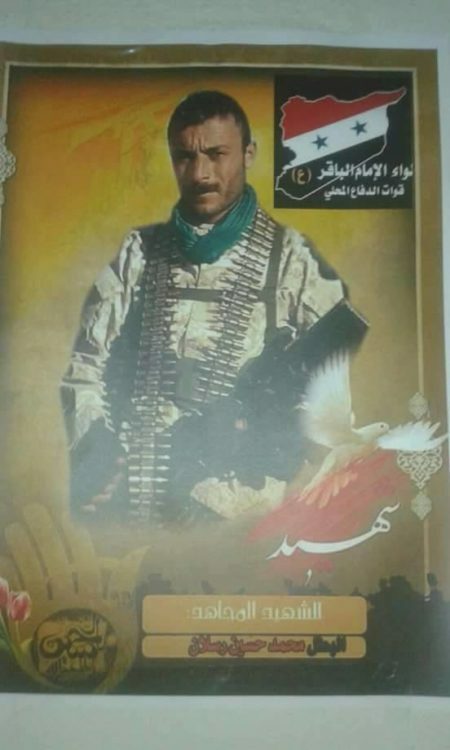 References to both Liwa al-Baqir and the Local Defence Forces can be traced at least as far back as 2014, with Liwa al-Baqir portrayed in one of the posts as being part of the Local Defence Forces. In a post from July 2014, the Palestinian Aleppo-based militia Liwa al-Quds defined itself as fighting within the framework of "the Local Defence Forces affiliated with the Syrian Arab Army." More generally, a reference to the Local Defence Forces implying the structure is a new entity can be found in late February 2014. The Local Defence Forces back then were described as "the sons of the south and east countryside of Aleppo city: large forces, equipped and trained, prepared to undertake new military operations in east Aleppo countryside." What may well be the case is that the militias that are now formally part of the Local Defence Forces framework- including Liwa al-Baqir- can trace origins all the way back to 2012 but were more formally organized into that structure in 2014 under Iranian and Hezbollah direction, similar to the National Defence Forces' organization of many militias in 2012-2013. Liwa al-Baqir simply trumpets connections to Iran and Hezbollah more and perhaps has stronger ties, principally on account of ideological/religious affinity. In any case, the Local Defence Forces affiliation remains clear. Indeed, on 18 September, a Liwa al-Baqir account- calling itself 'Jum'a al-Baqir Baqir'- put up a post entitled 'Liwa al-Baqir' featuring a certificate of thanks offered by the Local Defence Forces leadership to one Jum'a al-Ahmad (who appears to run the Jum'a al-Baqir Baqir account) for his efforts. Jum'a al-Ahmad is identified as a Liwa al-Baqir fighter in a post by Mohamad Hendawi regarding the death of Jum'a al-Ahmad's daughter, killed by rebel mortar fire in Aleppo. Update (29 April 2017): Just for clarity, as should become apparent in the posts above, Khalid Baqir has multiple siblings. 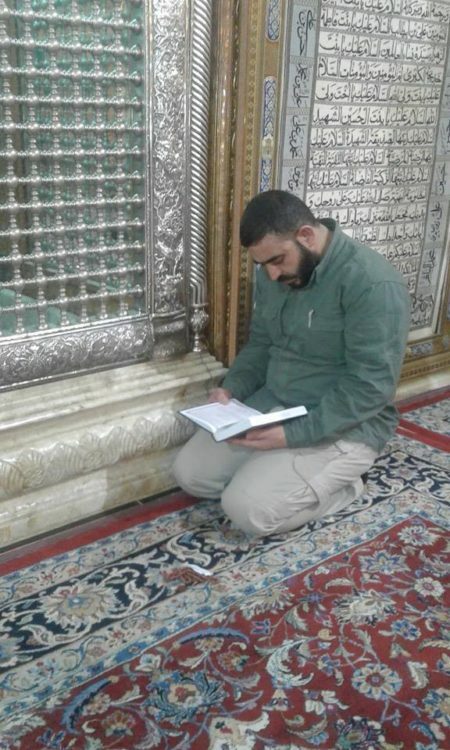 Thus, the March 2016 'martyrdom' is presented as the death of a brother (Muhammad Hussein al-Hassan al-Aloush) of Khalid Baqir, not al-Hajj Hamza.